Halloween: You ready to trick or treat? Have you ever visited the Tennessee State Capitol? The historic building has several ghost stories tied to it with some of them even presidential. But first comes the best-known story of the architect and the overseer. Nationally famous architect William Strickland was hired in 1845 to design Tennessee's capitol building. A student of Benjamin Latrobe (who designed the U.S. Capitol), Strickland moved to Nashville from Philadelphia for what he foresaw as a temporary job. Fearful of costs overruns, the Tennessee Legislature, decided to hire Samuel Morgan to oversee the project. A Virginia native, Morgan was a merchant, architect and builder. His business, Morgan and Company, was the largest wholesale importer of dry goods in Tennessee. Appointed to the commission in charge of planning the new state capitol, Morgan became president of the group and was ironically instrumental in choosing Strickland as architect. Once the famous architect landed in Tennessee, the conflict began. The project turned into a nine-year battle between Strickland and Morgan. 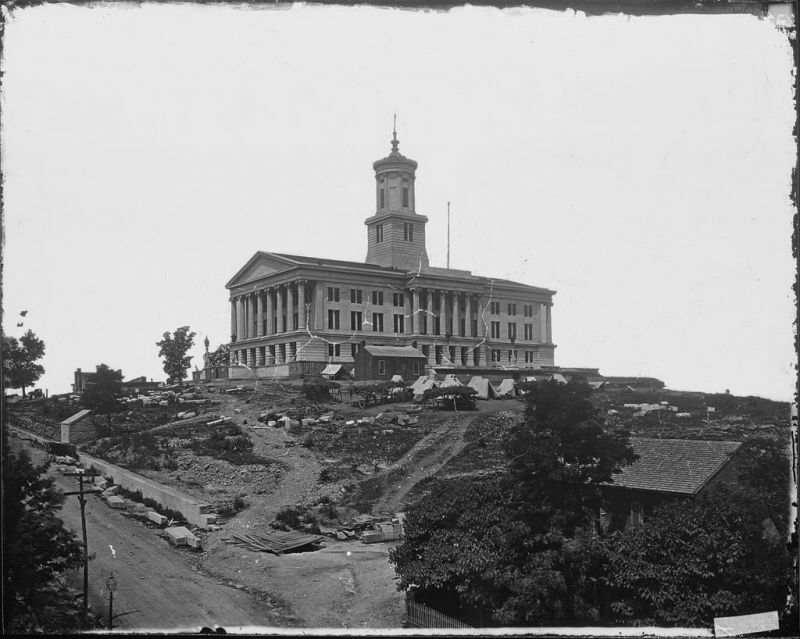 Both men developed a severe dislike of each other and were often seen screaming back and forth as the battle over Tennessee's statehouse continued. Strickland died in 1854 before the structure was completed. His remains were interred in a special vault in the walls of the northeast corner of Capitol. Morgan outlived Strickland. During the Civil War, Morgan manufactured munitions for the Confederacy until Nashville was seized by Federal forces. He had two sons killed during the war and his nephew was Brig. John Hunt Morgan, who married Mattie Ready (of Readyville) in a famous Civil War-era wedding in Murfreesboro. Surviving the Civil War, Morgan died in 1880. A decision was then made to place his remains in the southeast corner of the Tennessee Capitol. Yes, the two men who had fought so much over construction of the Capitol were buried in opposite corners of the limestone structure. Some say the bickering continues to this day. Reportedly, even police officers have heard their arguments and moved in to investigate only to find the building deserted. While the ongoing battle between Strickland and Morgan continues, other ghost stories have been linked to the state Capitol. Another tale features the ghost of a Confederate soldier, who has been spotted both inside and outside the Capitol. Members of a construction crew hired to renovate the building reported being shoved or loudly told not to touch furniture and other fixtures. At times, this ghostly force would move furniture back to its original location. Better known are the spirits surrounding President James K. Polk's Tomb. Polk bested Vice President Martin Van Buren on the ninth ballot to win the Democratic nomination as a candidate committed to "Manifest Destiny" as espoused by Andrew Jackson. He went on to defeat Whig opponent Henry Clay chiefly over the annexation of Texas. Once in office, Polk expanded America's borders to include Oregon, California and New Mexico. Polk oversaw the opening of the U.S. Naval Academy and the Smithsonian Institution, the groundbreaking for the Washington Monument and the issuance of the first postage stamps in the United States. Polk was married to Sarah Childress was born in 1803 to Joel and Elizabeth Childress, prominent Murfreesboro Democrats. She was well-educated, having attended the Moravian's Salem Academy in Winston-Salem, North Carolina as well as Bradley Academy in Murfreesboro where she first met Polk. Polk served one term and retired to his new home, Polk Place in Nashville. He didn't live long ... three months. Congress voted a $5,000 a year pension for Mrs. Polk who lived 42 years after her husband's death. She always wore black. She died at age 82 and was buried next to her husband at Polk Place. A decade later, Polk Place was torn down and their bodies were exhumed and re-interred in a tomb on the grounds of the state Capitol. There are stories that the re-interment of the bodies of President Polk and his wife Sarah may have stirred up their spirits as well. Visitors have reported seeing dark shapes moving near the tomb. Strange images have also been captured in photographs of the tomb. The final legend involves a ghost in the tower of the state Capitol. Passersby have reported seeing a woman walking about the tower of the building both during the day and at night. The tower is a unique feature of the capitol building. Tennessee's is one of a few state capitols without a dome. Some say the ghost is that of Rachel Jackson, wife of President Andrew Jackson, who died shortly after her husband's election and 31 years before the state Capitol was complete. Neither Jackson had a connection to the state Capitol. In fact, during the formative years of Jackson's political career the state capitol was located in Murfreesboro. However, there are those who still insist the ghost is that of Mrs. Jackson. There is a statue President Andrew Jackson on the Capitol ground was well as one of President Andrew Johnson . Other monuments on the grounds include the Sgt. Alvin C. York Memorial, the Tennessee Holocaust Commission Memorial, the Sam Davis Memorial at the southwest corner of the Capitol grounds, the Sen. Edward Ward Carmack Memorial located above the Motlow Tunnel near the south entrance, and the Memorial to Africans during the Middle Passage at the southwest corner of Capitol grounds. Guided tours of the Tennessee State Capitol are available on Monday through Friday at 9 a.m., 10 a.m., 11 a.m., 1 p.m., 2 p.m., and 3 p.m., beginning at the Information Desk on the first floor. Groups of ten or more should make a reservation prior to their visit by calling the Public Programs Department at (615)741-0830 or toll-free 800-407-4324.